A new graphene-based wearable patch that monitors and regulates blood glucose levels in sweat could make managing diabetes much easier for patients, according to researchers from Korea’s Institute for Basic Science (IBS), Seoul National University, MC10, and the University of Texas at Austin. The stretchable silicone device, which sits comfortably on the skin, is fabricated from gold-doped graphene on a gold mesh layer with integrated glucose, humidity, pH, and strain sensors [H. Lee et al., Nat. Nanotechnol. (2016), doi: 10.1038/nnano.2016.38]. The gold-doped graphene and gold mesh form an efficient electrochemical interface, relaying electrical signals between the sensors and the rest of the device. While the graphene is a naturally soft and conformable carbon material, the gold mesh is deposited in a serpentine pattern to make it flexible too. The device initially monitors the increase in relative humidity and collects sweat until the point is reached where glucose and pH monitoring can begin (RH >80%). The sensors detect real-time changes in glucose and pH levels, such as the rising glucose levels indicative of hyperglycemia. 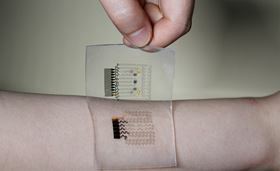 The strain sensor, meanwhile, detects the tremors associated with hypoglycemia. ‘‘Multiple sensors integrated in the patch consider the environmental factors of the user and correct the monitored sweat glucose data to be more accurate,’’ explains Dae Hyeong Kim of IBS and Seoul National University. As well as monitoring blood-sugar levels, the real-time glucose-pH monitoring can trigger an embedded heater to thermally activate microneedles loaded with the drug Metformin, which can be used to treat diabetes. This minimally invasive monitoring and treatment patch could offer a practical and pain-free alternative to current methods, which require patients to provide regular blood samples via finger pricking. As diabetes is one of the most prevalent chronic conditions, noninvasive and painless glucose monitoring could make treatment more effective and avoid potentially harmful hyper/hypoglycemic events. Long-term reliability and stability issues still need to be addressed with the graphene-based electrochemical device, admits Kim, but he believes the technology spells a bright future for diabetic patients. Zhenan Bao of Stanford University agrees that the approach is very promising for practical applications. ‘‘The researchers have shown that they can use gold-particle modified graphene to increase sensitivity for glucose detection in sweat, which is an important finding for wearable electronics,’’ she says.